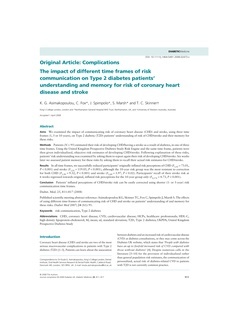 Aims We examined the impact of communicating risk of coronary heart disease (CHD) and stroke, using three time frames (1, 5 or 10 years), on Type 2 diabetic (T2D) patients' understanding of risk of CHD/stroke and their memory for these risks. Methods Patients (N = 95) estimated their risk of developing CHD/having a stroke as a result of diabetes, in one of three time frames. Using the United Kingdom Prospective Diabetes Study Risk Engine and the same time frame, patients were then given individualized, objective risk estimates of developing CHD/stroke. Following explanation of these risks, patients' risk understanding was examined by asking them to report again their risk of developing CHD/stroke. Six weeks later we assessed patient memory for these risks by asking them to recall their actual risk estimates for CHD/stroke. Results In all time frames, we successfully reduced participants' originally inflated risk perceptions of CHD (F 1,92 = 73.01, P > 0.001) and stroke (F 1 91 = 119.05, P > 0.001), although the 10-year risk group was the most resistant to correction for both CHD (F 1,90 = 9.32, P > 0.001) and stroke (F 2,88 = 3.97, P > 0.02). Participants' recall of their stroke risk at 6 weeks regressed towards original, inflated risk perceptions for the 10-year group only (F 4,176 = 4.73, P > 0.001). Conclusion Patients' inflated perceptions of CHD/stroke risk can be easily corrected using shorter (1-or 5-year) risk communication time frames. © 2008 Diabetes UK.